*Dilly Dolls*: Horrorfest is upon us!! As the halloween-holiday fast approaches theres all sorts of fun things to check out on the grid, make sure you check out the Horrorfest before the month is over though, if you miss it you will regret it!! What is Horrorfest you ask? Well its a charity fair set up to raise money for the Sophie Lancaster Fund. 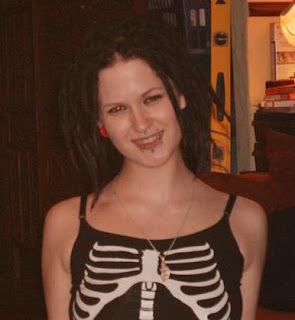 As you may or may not know, Sophie Lancaster was a young goth from Bacup, UK who was beaten to death just for being a goth in 2007. If you want to hear more, check out The Sophie Lancaster Foundation website. The Sophie Lancaster Fund aims to campaign to have the UK Hate Crime legislation extended to include people from “alternative subcultures” or “Lifestyle and Dress”. All proceeds from the charity vendors at Horrorfest will go to the Sophie Lancaster Foundation to help it achieve its aims. There are loads of amazing designers involved with Horrorfest, including Dilly Dolls. 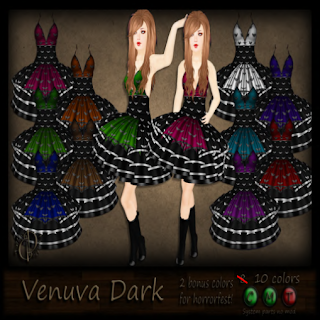 Oriana has set out the brand new Venuva dress as her charity item. 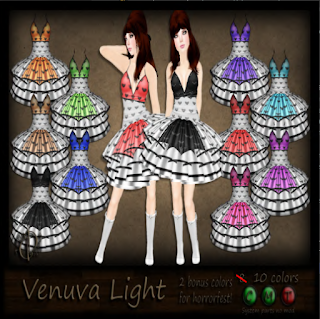 There are two packs you can buy, either light colours or darks, all proceeds go to the Sophie Lancaster Foundation.